The Ford 5.4L V8 is one awesome engine. 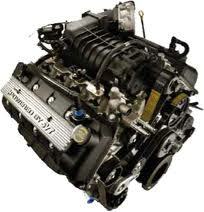 This engine is so great that Ford produces it for trucks, vans, Mustangs and other vehicles. Ford knows its power and so does many 5.4L owners. When you are searching for new Ford crate engines, you can run into some problems if you are not careful about what you select. Very few dealers actually explain what you receive and just reprint the factory specs from the manufacturer. We don’t do that here. We tell you what you get, offer you our low price and leave it up to you to decide if you want to order. All of our Ford crate engines 5.4L for sale come with warranty coverage to give you the extra peace of mind you need to make your purchase. A Ford crate engine is just like something that Ford puts into each of their vehicles. The only difference is that it is sold directly to consumers and not to a dealership. We personally build every 5.4L crate engine that we sell and put our passion and love into the process. You won’t find any low quality parts. Our components are the real deal and that’s how we maintain our OEM Ford quality in our crate engines. We build engines with our own expert hands and we are not ashamed to brag about it. We have found, hired and trained the best Ford engine builders that money can buy to build our crates. The expertise that goes into our work is proven accurate by our SIM testing equipment. Some dealers just bolt on parts and crate the engine up for sale with no testing. There is no way to verify the accuracy of the crate build without some form of mechanical testing. Our computer assisted tests make sure compression is right, no leaks are happening and the correct burn off of fuel is happening. Our customer service is another thing that sets our engine company apart from others. We are passionate and dedicated professionals that work very hard to get you a great 5.4L engine deal. When you speak or correspond with us, you are treated fairly and we respond to all concerns very quickly. Our engines receive our TLC, but we like to throw in a little extra something for you as our customer. Our no-hassle 3-year warranty is given out with every purchased crate engine. We know this is important and we hate 12,000-mile one-year warranties. We treat you a lot better at www.crateenginesforsale.com. We get into our computer database and find you the lowest price we can. This is much better than advertising a price on our website that changes constantly. You can use our quotation form on this page if you want an emailed quote. Give us a minute of your time and you’ll get the lowest 5.4L crate engine price on the Internet.